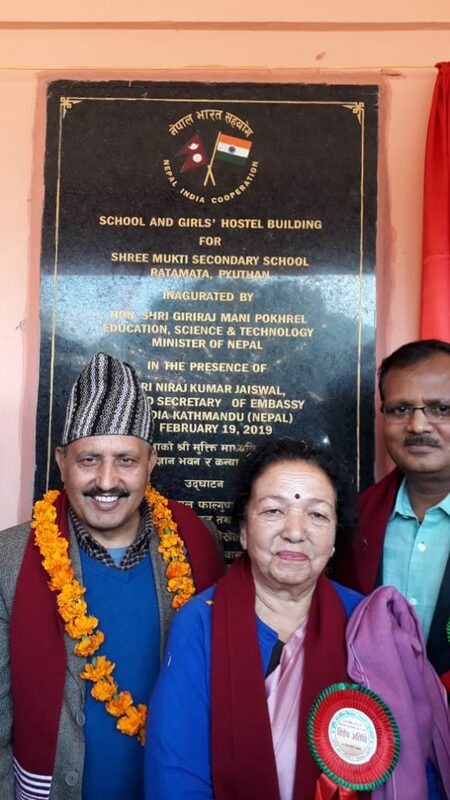 On February 19, 2019, Hon’able Minister of Education, Science and Technology, Government of Nepal, Mr. Giriraj Mani Pokhrel inaugurated Shree Mukti Secondary School, Ratamata, District Pyuthan. The inauguration ceremony was attended by Shri Niraj Kumar Jaiswal, Second Secretary (Education), Embassy of Bharat in Kathmandu. Established in 1951 and presently with 1054 students, Mukti Secondary School is affiliated with National Examination Board (NEB) and offers plus two (10+2) programs in Science, Management and Education Stream. Mukti Secondary School has an illustrious tradition as an educational institute of repute in the entire mid-western region of Nepal. This is the only school providing education in science stream in this remote hill district. In 1961, the Embassy of Bharat was associated with the construction of the Sanskrit Section of the School. The new infrastructure constructed with Government of Bharat’s grant assistance of NRs. 26.30 million, which includes new class room blocks, ladies’ hostel, guard house, water tank and boundary wall, would help the school in upgrading to higher secondary level. This is the first educational infrastructure project with Bharat’s assistance in Pyuthan District. 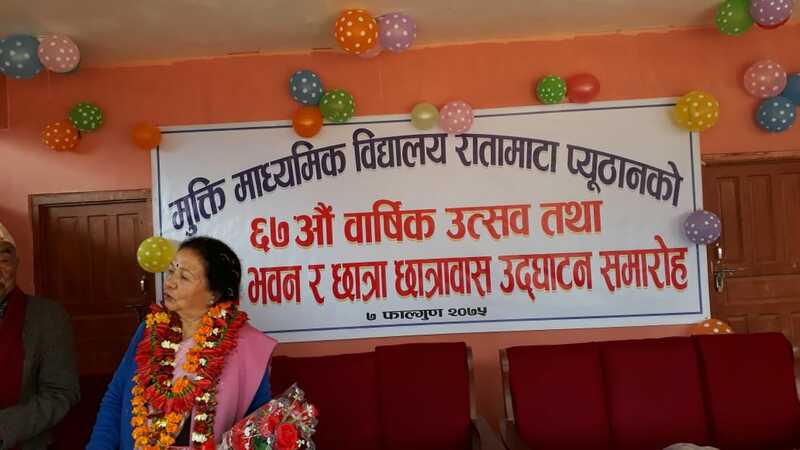 The newly built infrastructure will not only boost learning environment of students but also enhance access to education to needy, poor and marginalized students of Pyuthan District and mid-western region of Nepal.